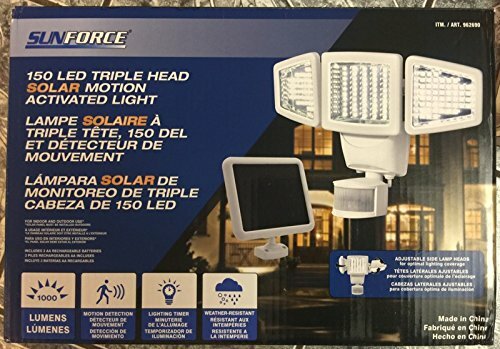 Use the power of the sun to light dark areas and add extra security with theSunforce 150 LED Solar Motion Security Light with three adjustable heads. Thislight automatically turns on when motion is detected, making it the perfectsolar security solution. Provide lighting and security to your garage,pathway, shed or remote cottage anywhere, anytime. Use the power of the sun tolight dark areas and add extra security with the Sunforce 150 LED Solar MotionSecurity Light. Enjoy peace of mind with a detection distance of 30 feet, anda detection range of 180 degrees. It's powerful security coverage for nearlyall driveways, porches, decks, sheds, and more.